6 X USB Raisers included! Color of the PCB might change as we always upgrade our products. This is the real deal, don't be fooled by lower priced rigs. This has all the parts same as on some youtube videos. Stackable open air design, perfect for muti-GPU equipment. Keep your video cards extra cool with this open air design. Plenty of room between cards allow airflow. 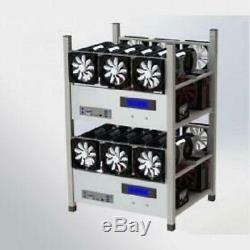 Note: This is the luxury version you will get 6 fans(3 rear and 3 front) on top of the temperature monitoring kit. Frame only, no computer hardware is included, you need to get your own motherboard, memory, PSU, CPU and GPUs. 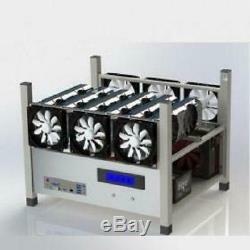 Holds: 6pcs graphics (video) cards. Holds: 1pcs 3.5" hard drive and 1pcs 2.5" hard drive. Temperature monitoring LCD panel included. Everything you need is included! Dimension(LWH): 19x16.5x15 inch. Do not lift case from handles. Only lift case from the bottom, holding the motherboard plate. 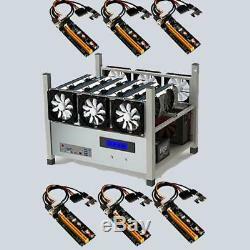 The item "Crypto Mining Frame Rig Case 6 GPU ETH BTC Ethereum + 6 USB Raisers Package Deal" is in sale since Tuesday, February 27, 2018. This item is in the category "Computers/Tablets & Networking\Computer Components & Parts\Computer Cases & Accessories\Computer Cases". 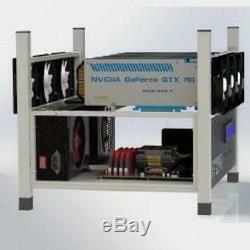 The seller is "servicesnproducts" and is located in Canoga Park, California.